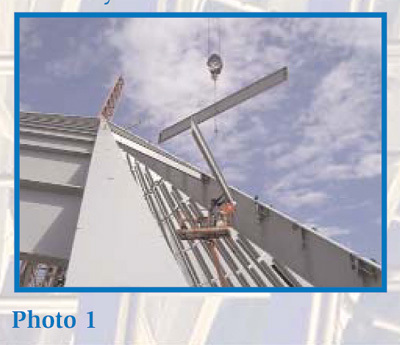 The December 2006 issue of Insulation Outlook featured an article on the new National Museum of the Marine Corps in Quantico, Virginia, a unique structure that incorporates innovative use of audio-visual aids and climate control to give visitors an “immersive” experience that brings history to life. This article explores the green design elements that make the museum not only a lasting monument honoring the brave men and women who have served in the Corps, but a forward-looking structure designed to be environment-friendly into the future. As energy and environmental concerns—from a local to a global scale—grow increasingly prominent in the news, consumers and industry seek ways to conserve energy and preserve the environment. Green building is gaining attention and favor. As a trend with marked effects on the insulation industry, it is clearly worth looking at more closely. According to the EPA, buildings in the United States represent 39 percent of total energy use, 68 percent of total electricity consumption, and 38 percent of carbon dioxide emissions. Add to that figures from the U.S. Green Building Council (USGBC) —which addresses the question “Why Build Green?” on its website (www.usgbc.org) —indicating that U.S. buildings also account for 30 percent of raw materials use and 30 percent of waste output, and the scope of the opportunity for improvement becomes apparent. In an effort to standardize green building practices, the USGBC developed the Leadership in Energy and Environmental Design (LEED) Green Building Rating System™ in 2000, and now it is nationally accepted. Assessing performance in critical areas of “human and environmental health, sustainable site development, water savings, energy efficiency, materials selection, and indoor environmental quality,” LEED programs apply to new and existing buildings, commercial and residential projects, and more. Given the growing interest in building green, when the time came to choose an architect for the new National Museum of the Marine Corps, a key element for consideration was responsiveness to energy and environmental needs. The design was open to national competition. Some 30 architects participated in phase one of the competition before the field was whittled to a final four, from which Denver-based Fentress Bradburn Architects, Ltd., was selected. The firm’s entry combined strong, innovative design with energy-conserving and sustainable design approaches. Fentress Bradburn has a history of sustainable design. In 1993, the company received the Architecture and Energy Award for the Natural Resources Building in Olympia, Washington. Since then, it has won awards for 40 projects that merit distinction in green architecture, including the 2003 LEED Gold 2.0 award for the California Department of Education Headquarters Building. In addition, according to the company’s website, more than 30 percent of its licensed architects are LEED accredited. The gallery section of the museum features a green roof system consistent with the sustainable design concept of earth integration. According to Cannon, this system covers more than three-quarters of the roofing (see Figure 1). Although not yet as popular in the United States as in Europe, green roof systems have potential to reduce capital and operating costs. Green Roofs for Healthy Cities, a not-for-profit association focused on increasing awareness of the benefits of green roof systems, as well as the market for related products and services, describes potential areas for cost savings at its website (www.greenroofs.net). One such area—where green roof systems offer the same type of benefit as commercial insulation—is in reducing energy costs. According to the organization, “Twenty centimeters (cm), or 7.9 inches, of substrate with a 20- to 40-cm (7.9- to 15.7-inch) layer of thick grass has the combined insulation value of 15 cm (5.9 inches) of mineral wool.” Along with thermal insulation, green roof components such as soil, plants, and air layers offer sound insulating properties as well. In addition to savings on heating and cooling costs, green roof systems can reduce maintenance and replacement expenses. Green Roofs for Healthy Cities estimates that a green roof (whose membrane is protected) can last up to twice as long as a conventional roof. Green roofs also can reduce or eliminate the need for roof drains, as the substrate and plants absorb a good percentage of precipitation (exact figures depend on the type of materials and plants selected, season, and other factors). 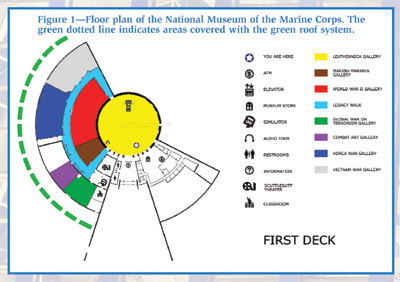 At the National Museum of the Marine Corps, according to Cannon, “the installed [green roof] system is by Henry. From the inside out it is made up of concrete-filled acoustical metal deck on steel structural system, green roof membrane, building rigid insulation, composite drainage material and root stop, filter fabric separation layer, 6 inches of soil mix, and ballast aggregate around the perimeter.” Although some green roofs are designed to support “urban agriculture,” serving as food-producing gardens as well as a roof for the structure, the museum’s green roof is more aesthetically motivated. As a design element, the grass and flowers on the roof match those on the surrounding hills. 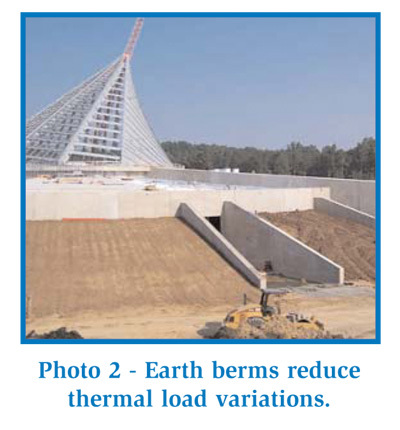 In addition to the green roof, earth berms are used at the museum to reduce thermal load variations (see Photo 2). Energy and environmental issues are in the news these days—from the latest turn in oil prices to the global warming debate. While not always completely informed about the issues, the public is concerned and is voting with its feet, driving hybrid automobiles and participating in recycling efforts. Industry is motivated (as it always has been) to reduce costs. Green building efforts answer these concerns, and the insulation industry will need to participate. (1)See www.buildinggreen.com for a checklist on building green from Environmental Building News.